Author: Palmer, Alan Set In . . .
Like England’s Charles II, the Ottoman Empire took “an unconscionable time dying.” Since the seventeenth century, observers had been predicting the collapse of this so-called Sick Man of Europe, yet it survived all its rivals. As late as 1910, the Ottoman Empire straddled three continents. Unlike the Romanovs, Habsburgs, or Hohenzollerns, the House of Osman, which had allied itself with the Kaiser, was still recognized as an imperial dynasty during the peace conference following World War I. 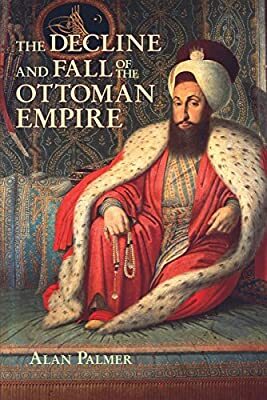 The Decline and Fall of the Ottoman Empire offers a provocative view of the empire’s decline, from the failure to take Vienna in 1683 to the abolition of the Sultanate by Mustafa Kemal (Atatürk) in 1922 during a revolutionary upsurge in Turkish national pride. The narrative contains instances of violent revolt and bloody reprisals, such as the massacres of Armenians in 1896, and other “ethnic episodes” in Crete and Macedonia. More generally, it emphasizes recurring problems: competition between religious and secular authority; the acceptance or rejection of Western ideas; and the strength or weakness of successive Sultans. The book also highlights the special challenges of the early twentieth century, when railways and oilfields gave new importance to Ottoman lands in the Middle East. Events of the past few years have placed the problems that faced the last Sultans back on the world agenda. The old empire’s outposts in the Balkans and in Iraq are still considered trouble spots. Alan Palmer offers considerable insight into the historical roots of many contemporary problems: the Kurdish struggle for survival, the sad continuity of conflict in Lebanon, and the centuries-old Muslim presence in Sarajevo. He also recounts the Ottoman Empire’s lingering interests in their oil-rich Libyan provinces. By exploring that legacy over the past three centuries, The Decline and Fall of the Ottoman Empire examines a past whose effect on the present may go a long way toward explaining the future.